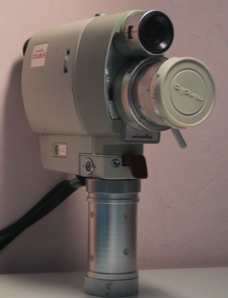 Produced in 1962, this movie camera was equipped with a lens Zoom-Rokkor 1:1,8 da 10-30mm. Its weight is kg. 1,500 and its measures are the following: 185x130x55. The housing is metal and the color is white and light green. The "Minolta Zoom-8" featured for the first time a built-in and coupled CdS exposure meter. The meter automatically controls the lens aperture at a measurement angle of 15 degrees.